A group of citizens, scientists, advocates and activists committed to helping our watershed! A founding member of the SPCWC, Paul has been instrumental in the success of all of SPCWC’s major accomplishments and undertakings. Raised in Ohio, Bill came west to San Francisco State where he earned his BS and MS in Biology. For 27 years Paul worked at the EPA as a Life Scientist studying and protecting our wetlands. 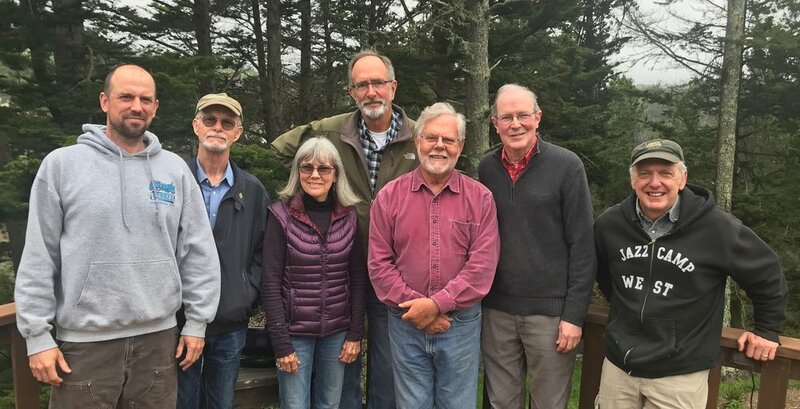 Paul has always been active in wild lands advocacy, serving advisory and Board roles with the GGNRA, Pacifica Land Trust and San Francisco Bay Bird Observatory. A long-time resident of the San Pedro Creek Watershed, Paul currently teaches sailing and celestial navigation in the San Francisco Bay. He is also know to travel far and remote, in his pursuit of landing an Oncorhynchus mykiss on a fly line. A resident of the San Pedro Creek watershed since 1980, Dr. Larson was a professor at SF State for 26 years before he retired in 2006. He keeps active in fish conservation activities, has logged over 2600 dives, and currently serves on the SF State Diving Control Board. Dr. Larson researches kelp forest and rock reef fishes off California, and was involved in the process of establishing a network of marine protected areas along the California coast. A resident of Pacifica, Jerry is Professor and Department Chair of Geography & Environment. Jerry Davis's research focuses on geomorphological field methods, related hydrological processes and biogeomorphic interaction, low-altitude remote sensing such as terrestrial LiDAR, and GIS surface modeling in investigating the response of streams and hillslopes to disturbances, assessment of stream restoration projects, and karst systems. Current projects include sites in coastal creeks impacted by urbanization, the northern Sierran montane meadows impacted by grazing and timber extraction, and the Marble Mountains Karst. Roger Mascio grew up in Chicago. But after serving in the Army in Vietnam, found a desire to travel and live somewhere away from the winds of Lake Michigan. Although it took another 10 years, Roger left Chicago and traveled the country working as a Union Electrician. Eventually settling in beautiful Pacifica in 1987, Roger is now a retired City of San Francisco Electrical Inspector. Roger loves being outside and in nature and does volunteer work for a number of causes. He knows his retirement will afford him more time in pursuit of SPCWC’s goals. Roger lives on the bank of San Pedro Creek and felt this reason enough to attend the first Coalition meeting in 1999, where he was elected to the Board of Directors and thus is as a founding member of the Coalition. Roger enjoys working with the diverse group of knowledgeable, good people on the Board. Director of San Francisco State University’s Sierra Nevada Field Campus, Jim Steele has opened the eyes and ears of countless students to the magic of California’s Sierra Nevada. Drawn to moving water like a moth to flame, Owen finds his solace from the Pacific Ocean to the Russian River. Raised on the Peninsula, Owen found Pacifica as the ideal place to raise a family; which he does on the banks of San Pedro Creek with his pregnant wife, son and dog. Educated as a Civil Engineer, Owen is aware of the impact us humans have left on our Eden but know with a couple tweaks can undo our wrongs and better coexist with the world around us. Pacifica resident, volunteer of the year. A Native Californian, Sharron grew up living in various parts of the state mostly near the coast and the Sierras. Camping and fishing with her family, exploring the forests, climbing on granite all ignited passions for nature that have never left. After a 20 year plus career in the airline and travel industry, she obtained a teaching credential and moved to education. For over 18 years Sharron taught in the Pacifica School District and involved herself belynd the classroom in environmental education. Since retiring in 2004, Sharron has continued her conservation efforts with the Friends of San Pedro Valley Park, as a Devil’s Slide Trail Ambassador, and now with SPCWC. Her passion for photography continues--for the past 12 years her photos have been featured in a Pacifica Calendar. She is active with the Art Guild of Pacifica and the Sanchez Art Center. Whether in her camper van or flying to some international destination with her partner, Bevan, travel will continue to be a major part of her life. John Keener is a retired Ph.D. research biochemist/geneticist who has lived with his wife in Linda Mar for 11 years. Attracted to Pacifica by its many hiking trails, open space, and beautiful coastline, John is an environmentalist who fights to protect our parks and open spaces, beaches, wildlife (including steelhead), and creeks.